This is a story of a constant weight free dive back in the late 1990's. It was a great early summer day off Key Largo. The water was calm and warm with good viz. I was out free diving with my good friend Spencer Slate's charter boat operation, Atlantis Dive Shop. Slate and I met at an intensive YMCA Diving Instructor Training Course held at FAU back in the mid '70's. Slate is famous for mouth feeding cuddas and eels. He has a collection of munched masks taken out by ballyhoo charging baracudas in high speed collisions. He has had so many injuries over the years that he has taken to doing his own stitching, ouch! He runs a first rate, world famous dive charter business right out of the north end of Key Largo. If you want to dive the Upper Keys, Slate is your man. I recall we hit two shallow spots under 25 ft. deep around the Elbow about a couple of miles apart. I did a lot of swimming and free diving that day while most of the folks SCUBA dived. That afternoon one of his smaller boats was heading out to the wreck of the USCGC Duane. Not having been on the wreck before, I tagged along to do some free diving. I had been free diving for about six hours up to that point and was real relaxed and warmed up. The USCG Duane was sunk as an artificial reef on even kneel in 1987 about one mile south of Molasses Reef in 120 ft. of water. She is 327 ft. long with her superstructure still intact and sits on a sand bottom. There was a moderate south running current that day. I hit the water near the buoy at the bow with free diving gear, no wetsuit and about 2 lbs. of weight. I breathed up for the free dive for about 10 minutes, mainly long slow inhalations and exhalations as was my custom in those days, removing my mask for the first few minutes to kick in the relaxation response. I followed with about five purge breathes and then filled my lungs about halfway and dove. I closed my eyes and slowly dolphin kicked downward. I opened my eyes periodically to see where I was at and eventually picked up some momentum and drifted down to the foredeck at 100 ft. still kicking but a bit more lightly. 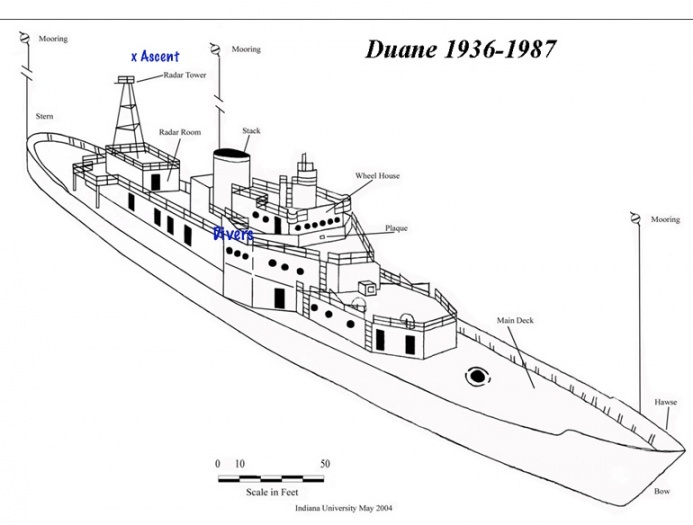 The starboard side of the Duane superstructure. I slowly arched up and across the foredeck and up past the the super structure on the starboard side. There were five SCUBA divers hanging out on the starboard bridge wing staring all over. I actually moved right in front of them but no one saw me, maybe narc'd a bit? I continued to rise but the current was strong and I remember passing close to and over the aft antenna. Eventually, I made it to the surface with a slow dolphin kick with no contractions. With the set of the current it must have been well over a 300 ft. swim underwater. Upon surfacing, I seemed to have suffered a minor sinus squeeze. So while doing so recovery breathing I took my mask off to try to relax and ease the sinus pressure. While doing this, I caught a large moon jellyfish right in the face! It only hurt for about 20 minutes but it did take the edge and ease off the dive for a while. A 100 ft. free dive isn't all that deep (stay tuned for the story of Martin Stepanek's 280 ft. scooter breathhold dive in the Caymans) but it sure was fun. Moon Jellys usually don't have all that painful a sting, unless it is on soft, thin skin like your face. You can do a video tour of the Duane at the link below. The photographer started at the stern and worked forward initially, opposite the direction of my dive. Last edited by RickI; 02-23-2018 at 08:40 PM. That's amazing, dude. I thought I was doing good to freedive to 30'! This wasn't that remarkable a dive although the drift with the current did stretch it out a bit. So much about deeper free diving is technique. As you kite you are probably already in good shape which helps as well. Knowing how to breathe up or prepare helps as does being able to thoroughly relax during the dive. With some training and practice many folks can do 60 to 100 ft.+ dives in a fairly short period of time. I used to think it took quite a bit more time to improve depth and duration. A recent course with Martin Stepanek has me rethinking this. This first morning in the pool he had several of us holding our breaths for 3 minutes + just by altering our technique. It goes far beyond that including instilling quite a bit of knowledge and technique dealing with acting as safety during your buddy's dive (one diver down, one up). I am planning a couple of articles on Martin and his program, it is pretty incredible. Last edited by RickI; 05-21-2007 at 01:41 PM. This wasn't that remarkable a dive although the drift with the current did stretch it out a bit. So much about deeper free diving is technique. As you kite you are probably already in good shape which helps as well. Knowing how to breathe up or prepare helps as does being able to thoroughly relax during the dive. With some training and practice many folks can do 60 to 100 ft.+ dives in a fairly short period of time. I used to think it took quite a bit more time to improve depth and duration. A recent course with Martin Stepanek has me rethinking this. This first day in the pool he had several of us holding our breaths for 3 minutes + just by altering our technique. I am planning a couple of articles on Martin and his program, it is pretty incredible. That'd be interesting. I love to freedive, mostly rivers and such, so depth isn't anything big, but being down for more than 30 seconds would be great. I would think they would have you well past that target in good order. I hope to interview Martin and fellow instructor Paul Kotik in the near future to pull together final details and images for the write ups. Quite a few notables have taken the course already, Laird Hamilton, Jerry Lopez, Tiger Woods, the son of the PM of Canada and others. Stay tuned, the articles should be intriguing. Last edited by RickI; 06-26-2007 at 10:44 AM. Like kiting, safety is paramount in free diving. About 20 years ago I read an article about shallow water blackout which made me rethink about diving alone. Free diving with a buddy on top while you are down is strongly recommended. Shallow water blackout is caused by the partial pressure of oxygen in the lungs dropping when you are surfacing. Your body is starved for oxygen and you black out near the surface. Your buddy should watch out for you and if he notices you stop on your ascent, he should bring you to the surface within 30 seconds or less and keep your mouth and nose out of the water. Upon regaining consciousness you will instinctively take a deep breath and if you are underwater that means filling up your lungs with water. Kite safe and dive safe. Good points. I think most divers would benefit from Martin's course just for improved routine free diving. I never knew it was a bad idea to submerge with a snorkel in your mouth. This despite studying breathhold diving since I was just a young spud. As you point out someone that loses consciousness due to shallow water blackout may be restored (with limited stimulation on the surface) AS LONG AS they don't have water in their lungs. That alone could cause death otherwise. The snorkel apparently maintains an open pathway that defeats the closing off of the breathing way that usually happens automatically without a snorkel in place. The course goes into shallow water blackout symptoms, signs, detailed techniques for avoidance, emergency retrieval, restoring procedures, etc.. Lots of good content derived from accident experiences in competitive free diving. It takes a lot of the randomness out of free diving particularly diving with a buddy with similar training who knows what to look for and how to react. A video comprised of several free dives using a scooter and two video cameras on the Duane in 130 ft. of water off Key Largo. 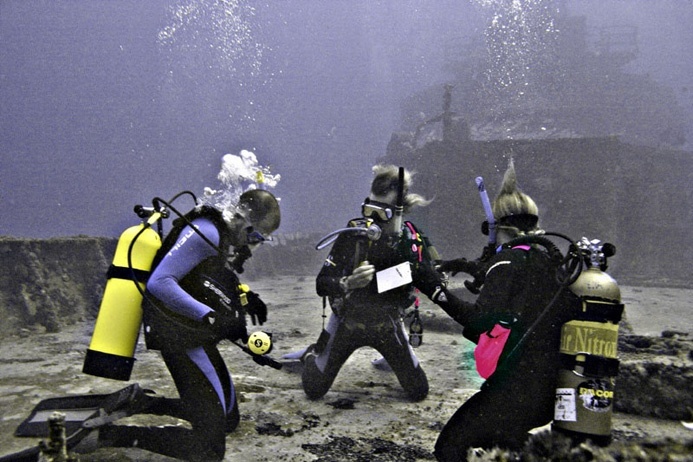 Thanks to Atlantis Dive Shop for running us out to the wrecks! Great job as always, for over 31 years! That is a long time to do something well. NOTE: Take proper training and use appropriate procedures before considering scooter free diving. It looks easier than it can be at times. NB - this is a repost of a thread from 2009 with some now vintage UW GoPro camera gear.